Do you guys remember Wheat Crunch? The little packages of crunchy wheat coated in seasoning? I didn’t either until I made my Main Taste Tester try roasted chickpeas. He was super hesitant to try them but then exclaimed, “These taste like Wheat Crunch!” Throwback! I was instantly transported back to the days when lunch included Beep and Dunkaroos and I wore skorts and wove a piece of lace through my French braid. These are like a more sophisticated and (I assume) healthier version of that little snack I loved in elementary school. I know this isn’t revolutionary or anything but we love these things and they are so versatile! Beyond that, they are the only way to get my Main Taste Tester to even consider eating a salad without meat. That is a HUGE deal around here. Once he made the wheat crunch connection, he totally fell in love with them too. They are awesome to snack on by themselves and can be seasoned any way you choose. Our favorite savory version is what I’m posting today but I really want to try a cinnamon sugar version next. Back comb your bangs, put on your stirrup leggings and whip up a batch of grown-up Wheat Crunch. You’re gonna love it. Lay paper towels down on a large cookie sheet and spread chickpeas out over top. Then take more paper towel and press lightly on the chickpeas, rubbing a bit. 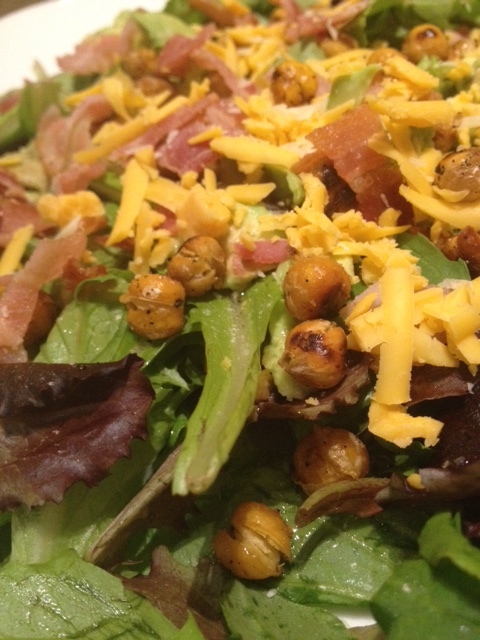 This loosens the chickpea skins and helps you to pull them off. I have tried leaving them on and they can burn easily when baking so I recommend removing them. Pat the chickpeas until skin and excess moisture is removed. The drier you make them, the more crispy they get in the oven. Once skins are removed and chickpeas are dried off, set them aside in a bowl. Line your cookie sheet with parchment if desired and drizzle with a bit of olive oil. Pour chickpeas back on cookie sheet in a single layer and roll around to coat. Sprinkle on seasonings evenly. Bake for 10 minutes. Take out of the oven, toss and bake for another 10-15 minutes until they look crispy and golden. Remove from the oven and let cool. The cooler they get, the more they crisp up. If you have leftovers, store in an airtight container although they are best enjoyed the same day they are made. They probably won’t last that long anyway. I speak from experience. Yum! I love roasted cherry tomatoes! 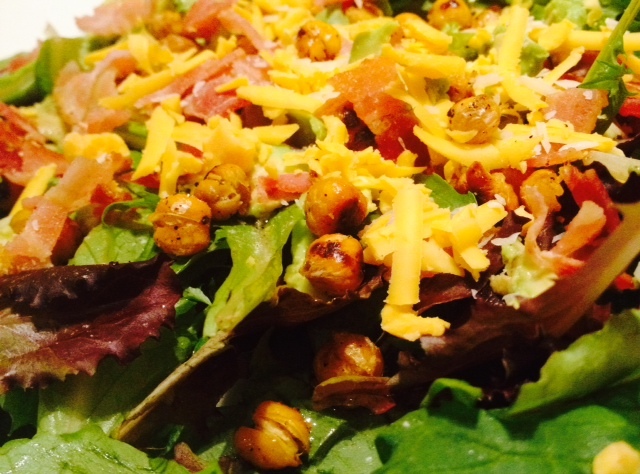 http://choosyeaters.blogspot.ca/search/label/Salads here is the link to my chick pea recipe. More recipes to come in March!